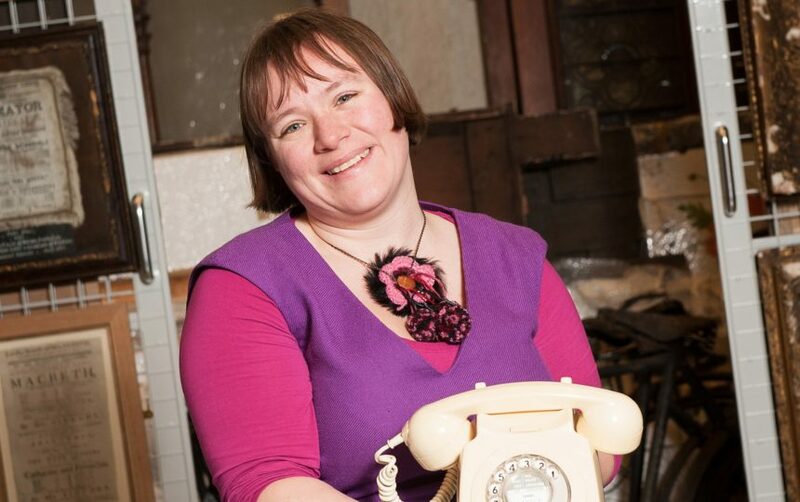 Kate leads a team of ten learning and access officers, and a digital learning officer at Leeds Museums and Galleries. Museums are about stories. Stories can be comfortable bedtime tales or challenging moral fables. Stories are social, and they are better shared. Are you sitting comfortably? Then I would like to tell you a tale, or two! Leadership and management of a team of ten learning and access officers, and a digital learning officer across nine museum and gallery sites. (Our staff are our greatest resource. They are creative, amazing, wonderful people who truly believe in access and inclusion. Leadership of them is about trusting what they know and guiding them through coaching and mentoring). Leadership and management of service-wide learning programmes and resources, including those for schools, families, under-fives, FE/HE and adults. (Leeds Museums and Galleries is the largest local authority museum service in the country. We want everyone to engage with their objects and their heritage, but it’s got to be relevant and appropriate, so we sometimes need approaches). City wide development of policies, strategies and cross-departmental projects across formal and informal learning. (I do a lot of advocacy work for museums, but also for arts and cultural learning. I am currently leading on the development of the cross art form, place based curriculum for Leeds. It draws on information, knowledge and resources from all the cultural providers across the city. Partnership is the only way to make us stronger). There is no typical day, but I drink a lot of tea! It can often take me at least 45 minutes to get a cup of tea from the staff room at one end of the building and walk back to my office. It’s not a big building, you can walk the distance in about 15 seconds at normal walking pace, but I stop to have conversations. Sometimes they are check in conversations, sometimes they are ‘how are you?’ conversations, sometimes they are allaying worries, sometimes they are about someone’s dog. They are all important conversations. I believe stopping to listen, being heard and providing action or support are all important leadership skills. I spend a lot of time in project, programme or strategic meetings. These can be internal, about things going on the service, or external, about city wide projects or over staff room tables with teachers. They are all creative in some way. This might be because we have to creatively problem solve around some tough decisions, because we’re panning the next big idea, or because we spend a lot of time with very excitable, creative people. I still deliver and teach. It’s important for me to keep teaching to stay grounded. Admittedly, it’s mostly teacher training now, but I try to deliver when I can to all age ranges. I love the ability to change the world, one small bit at a time. To capture someone’s imagination is to capture their heart and we can do that in creative, experimental ways. I appreciate the trust I have from colleagues and our head of service that means I can take creative risks, and I love working with fabulous people who know lots of stuff about lots of stuff – I am constantly in awe of that! And I love that I am still learning. In any large organisation, small changes often take a long time and there is usually a lot of paperwork that comes with it. That can be immensely frustrating. Half way through my English degree, my godmother (a very organised lady) asked me what I was going to do after I finished. I panicked and my thought process was… “I like visiting museums and historic houses, someone opens them to the public, how do I do that?” I volunteered for the National Trust, the Birmingham Archives and Swansea Museum to check I liked the idea, then applied for an MA Heritage Education and Interpretation at Newcastle University. At the same time I applied for, and got, AHRC funding to support me through the MA (I was very lucky). The Newcastle course had an eight week practical placement, which I hoped would help me get a job in the sector. It worked. I chose to spend the placement at Harewood House, and after the placement they asked me to stay, first as their assistant learning and access officer, then their learning and access officer. The opportunity came up to do a post-16 PGCE, so I did that with all my teaching practice through Harewood, and began my AMA. I was at Harewood for three years, then moved to the Imperial War Museum North as their community development manager for 18 months, completing my AMA whilst I was there, then moved to Leeds Museums and Galleries as the learning manager, then lifelong learning manager. In 2010-11, I took a break from Leeds to be the Clore Leadership Programme Learning Fellow (2010-11). It was an amazing experience, and I think it fast forwarded my self knowledge and leadership skills by about eight years. As part of the fellowship I undertook a coaching course, which has helped a lot in managing staff. Diplomacy, negotiation, organisation, a good memory for names and faces, being able to talk to anyone about anything, coaching skills and emotional intelligence help with staff management, passion and a love of what you do (is that a skill?) Generally being a personable human! You make your own luck. People will tell you it’s tough to get into museums, and I’m not going to say it’s easy, but say yes to opportunities, and be prepared to cross arts and cultural boundaries (you can always sidestep back into museums). Work out what your personal limits are – how much can you live on? how far are you prepared to travel for work? will you move? will you consider other arts roles? That will help you target your job search more effectively. If you want to work somewhere or for someone you admire, give them a call and have a chat, ask them if there’s anything coming up. Make an impression. It might just pay off! My team come from a range of backgrounds, not all of them have museum MAs or teaching qualifications. I don’t shortlist based on qualifications, but some organisations do. If you have a place in mind, or are applying for a job, ask whether they weight the shortlisting criteria. Finally, be tenacious. Keep trying. Or, set yourself a time limit to try. You can always change careers later on. You can read more on the museum and galleries pages of Leeds City Council’s website and also on the My Learning website.